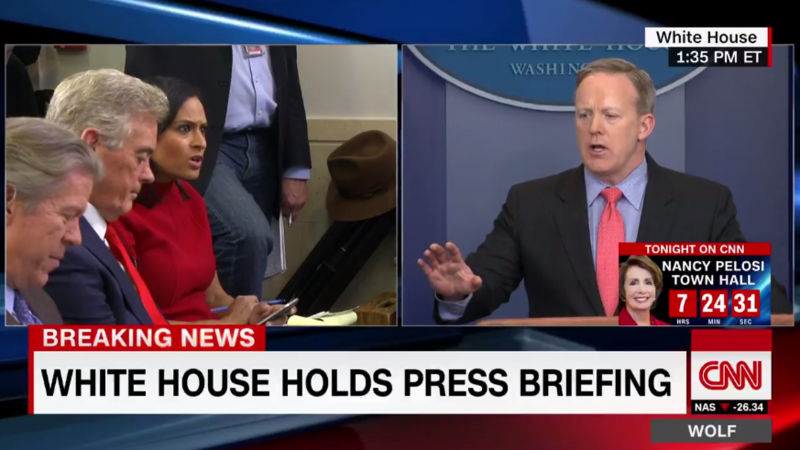 During Tuesday’s briefing, White House press secretary Sean Spicer was pressed by a reporter to call the executive order a travel “ban,” as President Donald Trump had in a tweet. Spicer argued that the President was simply using the language exercised by the media and that Trump "has been very clear that it is extreme vetting." “He says it’s a ban,” a reporter told Spicer. “He’s using the words that the media’s using,” Spicer replied. “Those are his words!” the reporter shouted. Check out the fiery exchange below. Trump has described the action as extreme vetting, desperately needed to combat the threat of radical Islamic terrorism. The media and Democrats have accused the action as being religiously-based, being that the seven countries listed on the executive order are predominantly Muslim countries. Democrats in Congress attempted to overturn the executive order but were unsuccessful at doing so.